Over 1200 large holes ranging from 3/8" - 3/4" in diameter need to be drilled into the side-of-body fittings on the 787 fuselage over four different assembly lines. The material stacks are 4" thick and consist of several layers of titanium and CFRP which must be drilled for one-up-assembly (meaning no deburr). These parameters stressed the manual drilling process in meeting hole quality and build times. The problem is complicated by the location of the fitting, which is over 4 meters above the factory floor. 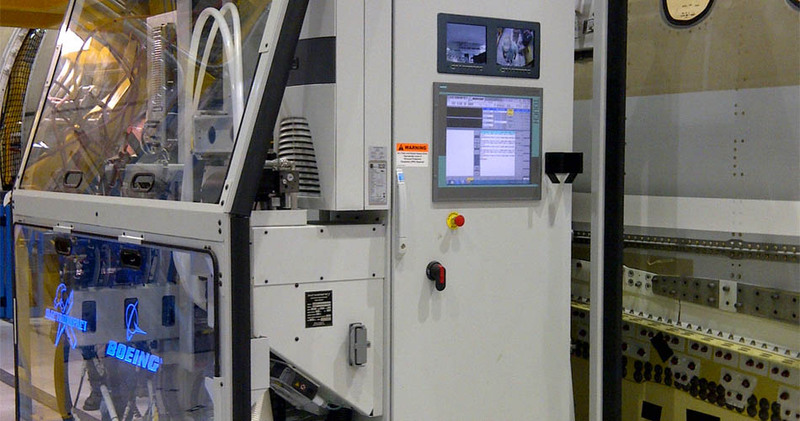 The main focus on finding an automated solution was stabilizing the drilling process for Titanium/CFRP stacks in the existing assembly lines. The solution was designed around a natural frequency of greater than 10Hz with a machine that weighed less than 8000lbs. Stabilization of the drilling process was achieved by focusing on three aspects: clamping on the fitting with double the drill thrust loads (up to 1200lbs), minimizing overall machine deflection to less than 0.020", and maintaining the relatively high natural frequency. Each machine is capable of being moved between production lines and both sides of the aircraft, allowing for increased production and maintenance flexibility. The drilling feed and speed are both servo-motor driven which allows for the drilling process to be controlled layer by layer. The on-board controls also monitor drill thrust and drilling profile for each drill bit at each layer to determine drill life. The result is improved hole quality, improved process reliability, and decreased manpower.